Due to ongoing work on major improvements of our Monthly Database, there is no printed version of the Handbook of Statistics 2008; it is only available in PDF and in Excel format. The next printed version of the Handbook of Statistics will be published in November 2009. The PDF version and Excel tables on CD-ROM cover the complete time series from 1990 to 2008. The Excel version can be used on any personal computer with MS Excel or another compatible software package, permitting a wide range of own analyses. Individual chapters (tables in MS Excel) are also available on CD-ROM or via Email in ZIP-format. The Download version is in PDF. 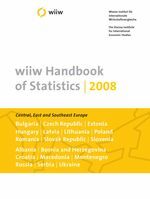 The wiiw Handbook of Statistics is published annually and contains annual and monthly statistics on the transition economies. The 2008 edition covers the period 1990 to September 2008.